A programme about 100 year old drivers is showing on ITV tonight at 19.30. One participant is 101 and loves two wheels ............ should be worth watching. Growing old is mandatory... growing up is optional - Bob Monkhouse - or - Chili Davies - or - Walt Disney... well someone said it first! You keep going Bill and I will follow. I'll be at the back. When my better half tells me to 'act my age' I reply "what do you expect from a 9 year old"
All kidding aside, I'm always stunned at the number of seasoned riders who still ride around in their eighties. There's gotta be something to it. Personally at 55, and having resumed riding by all weathers about six years ago (except if the tarmac is covered with oce or snow), I found I was hardly ever cold anymore, or even catch any kinda bug. I definitely feel in better shape now that I did five years ago. Cuban cigars cannot be the only reason, can they? 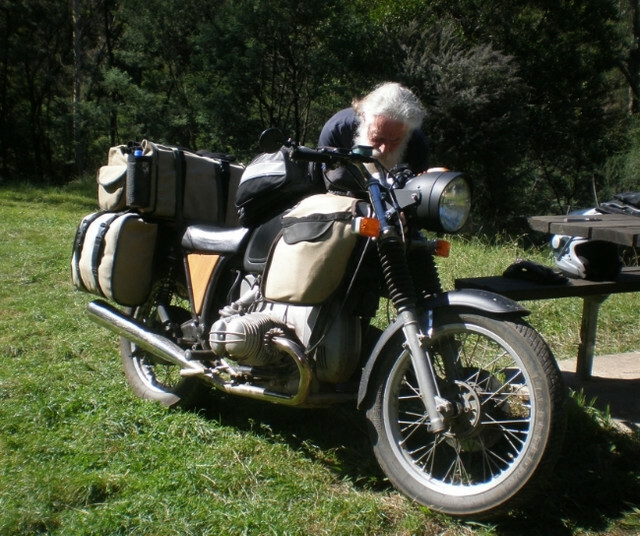 That is a photo of forum member Airbear and his R90/6. I know a small company in France used to offer such an accessory. I left them an email, I'll let you know. I'm exactly the same age as you but sadly can't say the same. I started riding aged 18, and have never had a break from riding. I didn't get a car till I was 35. Very little in terms of weather would deter me from riding. Things started to change a few years ago. I don't feel up to riding much in the winter anymore, and my annual mileage has plummeted from about 15,000 to about 5000. There's nothing physically wrong with me, so I have to assume my physical resilience is diminishing. I still have the passion, but the cold weather stamina has gone. I don't feel my age in any other area of my life other than bikes. I'd love to think I'll be one of these guys who's still riding into their 80's, but the reality is I don't think I will be. Well I thought I did George until a couple of weeks ago when I had an ambulance admission to hospital. The breathing problems that have been plaguing me for 16 months caused a heart attack and 8 days in 2 hospitals. I'm back home now and waiting for even more tests/scans/ etc. no driving for at least 4 weeks and cancelling all future holiday arrangements for this year. The Airhead event at Riseholme had to go today as I won't make it either. My grateful thanks once more to the NHS and all the staff. So sorry to hear that, Bill. I had heard that something had happened but nothing specific. Take your time and recover properly before getting carried away. Get well soon Bill, here's hoping for a full recovery. Sorry bro the little shop that made them now only focuses on seats. But I'll keep monitoring the classifieds if you want. There was a set for sale (albeit in red) a couple weeks ago... They do pop up then and now.